CLO or Chief Legal Officer is the chief lawyer in the company whose responsibility is to minimize the legal risk by advising the officers and board members about any regulatory issue within the organization. He is the most potent legal executive of any organization and also may be a member of their operating committee. You can quickly meet the Chief Legal Officer of any company if you have a highly accurate email list. But, if you do not use any such list and finding it challenging to target CLO’s of various segments, Blue Mail Media is here to help you. 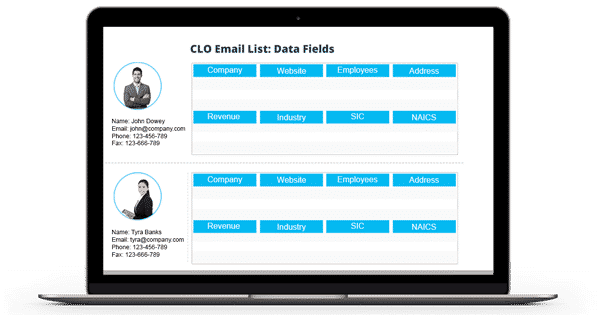 We provide the world-class CLO Mailing List that lets you meet the CLO’s of several industries regardless of boundary constraints. With the help of our list, you can design effective multi-channel campaigns and reap higher yields than ever before. Try our GDPR compliant list and know the difference by yourself. Blue Mail Media’s Chief Legal Officer Mailing List provides you the tailored information of CLO’s of various organization. With our list, you can have smooth interaction with the potential clients staying anywhere in the globe. That is, our list lets you reach CLO’s from various regions such as North America, Europe, Asia, Australia, New Zealand, Africa, the Middle East, and South America. You can fearlessly use our list since our team gathers it from authentic sources. The sources include yellow pages, business directories, surveys, conferences, government records, public documents, trade shows, websites, feedback forms, business meetings, and many more. Also, our team updates this CLO Email Database regularly to keep it free from errors and redundancies. It guarantees you more than 90% deliverability rate which is more than sufficient to execute the campaigns successfully. Buy our Chief Legal Officer Email List now and improve your conversion rate tremendously. You can either call us at 1-888-494-0588 or send an email to sales@bluemailmedia.com to learn more about our list. Our sales specialists are happy to help you! Our team of data scientists, analysts, and experts constantly dig out the most qualitative data to power your multi-channel marketing strategies. Also, we ensure that our List of CLO Email Addresses remains accurate and updated by making thousands of verification calls each day and sending out verification emails.